The Lane-Keeping System uses several technologies to prevent accidents. When drivers need to correct course, the Lane-Keeping System utilizes steering wheel vibration, steering torque or visual and audio warnings. The latter warnings trigger when an forward-looking camera linked to an alert system continuously monitors driver's patterns for deviations. 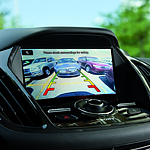 Pre-Collision Assist signals warning flashes and alert sounds when detecting another vehicle or pedestrian crossing in front of the Ford's path. Pre-Collision Assist complements Automatic Emergency Braking (AEB). AEB occurs when a driver's response lags after warning flashes and alert sounds transpire. Ford intends for the Co-Pilot360 suite to be standard on at least 90 percent of all new Ford models by 2019.